There was a lot of screaming in Jason Ponce’s installation, Primal Screen, on display at the opening of The Art of Sound exhibit at the Space 4 Art gallery in downtown San Diego, CA. The night of August 25th, you could stand in line and wait your turn to “scream” — behind a closed door, in front of a computer filming you from three angles as you unleashed your vocal chords into a microphone. I was there — a little shy to go all out, I sang a note into the mike and proceeded to join the rest of the crowd in the viewing room as the recorded shrieks and roars erupted across three floor-to-ceiling screens, subject to special audio and visual effects in a bizarre outer-worldly presentation. Screaming in front of a crowded room does seem a little absurd, but the candid nature of the act lightened the mood, providing for some hearty laughter among children and adults. As a child, Ponce would take apart electronic devices, from answering machines to toys like the “Speak & Spell,” rewiring them to produce crazy sounds — his own “strange instruments.” Unbeknownst to him at that time, this practice is called “circuit bending,” a form of experimental music. He studied music theory and played the saxophone in his teens, later becoming very involved in gamelan music — a traditional form of Indonesian musical ensemble — before segueing into composing various forms of electronic music. Now nearing the completion of his PhD in computer music at the University of California, San Diego (UCSD), he explores the connection between sound and the human body in interactive installations, through which people and technology interact to present a final product — in which the person is viscerally intertwined through the voice or the body. Flox, an installation he created in 2010, integrates the body seamlessly into its dynamically morphing soundscape, such that one’s movements dictate the manifestation of sound within the space. You may be familiar with this concept if you’ve ever played around with the Kinect for Xbox 360. The motion-sensing device tracks your movements using video, allowing you to control an avatar with your gestures and motions. When the Kinect came out, interactive artists around the world, like Ponce, began integrating this new technology into their art. In Flox, for which Ponce designed a tracking system that operates on similar principles, four people move about the space at a time, each in control of a different aspect of a sound composition. They’re instructed to move around so as to orient themselves in such a way that a harmony is achieved between the disparate elements. The participants need to cooperate and communicate in order to achieve the desired outcome. “So, one of the most effective strategies I saw people try was to have everybody but one person remain still, while the other person explored the space while moving around and then [they] were able to identify what tone they were in control of, or what aspect of the composition,” Ponce says. And that’s probably what the future of making music is going to feel more like. As more and more music is created electronically, computer musicians face a complicated dilemma that musicians of more traditional instruments, like the piano or violin, do not. Computer music isn’t EDM, or electronic dance music, that most of us are familiar with — even though they both involve a guy or girl with a laptop. An EDM show is all about what’s going on around the music — dancing, interacting with other people, drugs. But with computer music, there can sometimes be a disconnect that is apparent between the musician and the audience. Nobody — or at least most people — don’t want to sit in an audience and watch someone press play. 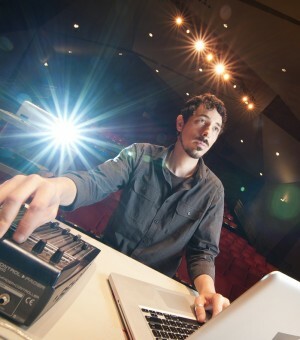 Ponce is working on designing those gestures that are not necessarily innate to computer-generated music, such that the sounds manifest through a more intimate connection with the body, and so that a musical performance resembles something a little more like Flox or the Kinect — in which the performer’s interactions have a direct bearing on the production of electronic sound. “It’s just deeply connected to the body,” Ponce says. He discusses that intersection between man and the machine as it takes place in his music and his art.